Surprise, surprise: another Dessay cancellation, the third I have experienced in 15 months. Time to bow out gracefully. Or perhaps that time has actually already passed. Clever work by the Met in delaying the announcement until we were all in our seats. No email notification like Royal Opera (though the Met are happy to send plenty of emails seeking membership and gifts), not even an insert in the Playbill this time. Peter Gelb’s presence on stage was met with derision as it was immediately clear what he was there to announce. The ‘cloud’, however, lived up to the old saying by having a sterling silver lining: the replacement casting of Danielle de Niese as Cleopatra, the role she originated in this production in Glyndebourne. David McVicar’s handsome new production contains an abundance of variety and movement to maintain audience interest across 275 minutes (including two intervals). Characterisations are uniformly strong, propelling the storytelling despite the intrinsically slow pace of the opera. The work also benefited from moments of cheeky humour. Changes of time and place are common enough for opera stagings, but the idea of transplanting well known historical characters Caesar and Cleopatra to the British Empire of the 1800s is a little jarring, attractive though the visual concept may be. Further touches, such as sprinklings of 1920s fashion, add to the splendour but also to the confusion. Robert Jones’ set is a good height for the Met stage, but its narrower width creates significant sight lines issues for the side seating of the wide auditorium. Multiple scenic elements fly in and out, the most appealing of these being the vivid jewel-toned curtains of Cleopatra’s chambers. Brigitte Reiffenstuel’s costumes are really beautifully realised, with Cleopatra being given a couple of gowns so glitzy they sparkle in the dark. And there is plenty of dark in Paule Constable’s inexplicably dim lighting design. Perhaps an authentic period look is the goal, but we have come to watch the performers, as well as hear them, so we need some light to actually be able to see them. 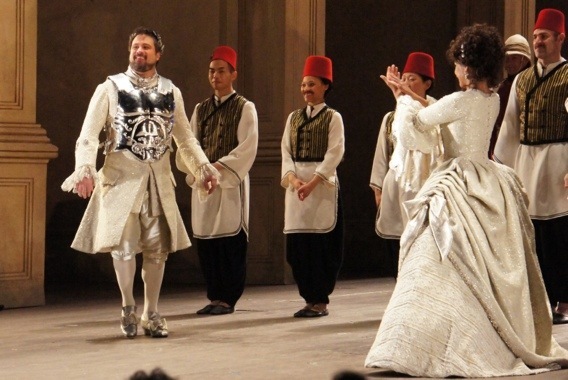 The role of a choreographer of an opera can often be a nominal one. Andrew George creates delightful work here, adding vaudevillean flourishes, along with Bollywood-esque moves, to the potentially static piece, thus increasing the overall enjoyment level. Conductor Harry Bicket leads the Met Orchestra in a flawless rendition of the score, the music flowing a smooth purity in which recitative and arias practically blended as one. The evening turned into an absolute triumph for Danielle de Niese, her joy in performing the role appearing to be as great as the audience’s pleasure in watching her. Exotically beautiful, de Niese radiates charisma whenever she is on stage. Her pure, clear soprano rings out with beauty and strength, her gift for expression expertly conveying Cleopatra’s transition from playful to despondent to joyful. And to top it all off, her nifty execution of the precise, tricky choreography appears effortless. Brava!! Talent and flair are in plentiful supply throughout the evenly matched cast, with the long evening fairly zipping by with one truly gorgeous aria after another. David Daniels is a solid anchor in the title role, his masculine appearance belying his delicate countertenor voice. Daniels enjoys frisky chemistry with de Niese, and manages the epic role with barely a drop of sweat. As Cornelia and her son Sextus, Patricia Bardon and Alice Coote are a supremely strong pair, each bringing a noble, highly focused quality to their roles. Bardon achieves particular success in displaying the steely resolve of the tormented Cornelia. Christophe Dumaux sings with a very strong countertenor as Ptolemy, brother of Cleopatra, also exhibiting a trim and highly agile body. Guido Loconsolo, as General Achillas, is one of the very few men to sing in bass voice and consequently comes across as all the more masculine. A splendid production overall that is a welcome addition to the Met’s repertoire. 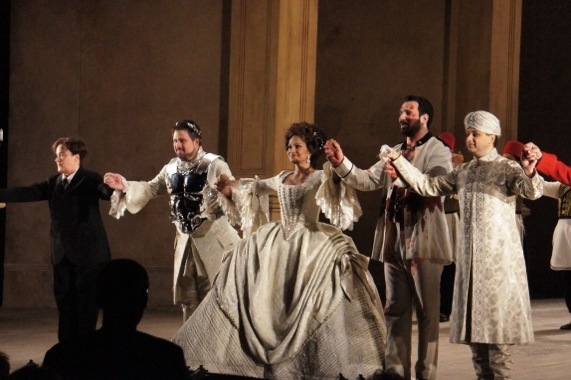 This performance on 9 April 2013 was the second of the current run of Giulio Cesare. 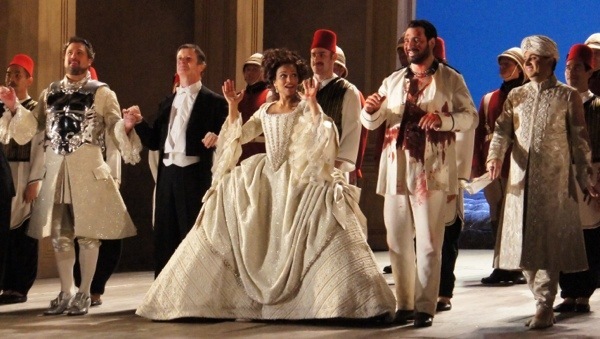 It continues at the Met until 10 May 2013, and is due to be filmed for the Live in HD series on Saturday 27 April 2013. Ah, the sickly one. She missed quite a few La Traviata last season. I haven’t seen JC yet but it has been getting good reviews including yours. I think you will love JC Siggy. The 4.5 hours flew by. As we left I heard several people say it was their favourite of the season. Hopefully Danielle will be in it when you see it. That’s for me and opera this season. Have to make do with the cinema screenings until I return this time next year. Keep letting me know what you think of all the productions! I saw it this evening (26th performance of it at The Met), from the Parterre, which makes it even better. I thought it was good though Handel is definitely not my favorite. I liked it more as it went along. Dessay was in it. My favorites are still La Comte Ory, La Rondine and Rigoletto and with the first two I’d like to see the female leads again in anything. Interesting to hear that Dessay was there for this performance. Maybe she is making sure that she will be in the Live in HD filming. I know what you mean about Handel. It was very well done in regard to the fact that it became more enjoyable as it went along. I really loved Cleopatra’s final aria – such a happy one. Hope you have kept the Playbill so you can follow those sopranos next season. I wouldn’t like to be Dessay following DeNiese. She created the role in the original production and it made her name, and much of the choreography was also created because they discovered she was also a good dancer. Saw the original production and both Glyndebourne revivals and she was just dynamite each time. The thing that will be most interesting will be to see which artist plays the role of Cleopatra in the Live in HD filming on 27 April. I imagine that Dessay will move heaven and earth to take part in the filming, but de Niese could easily triumph again. Let’s all just wait and see.. I am so jealous! I am already back in Australia as of today and look at what I am missing. I would love to have seen Rigoletto. Hope they release it on blu ray. Interesting to hear about the head of Paris Opera being there. Was this is the Times? Good gossip! I am already looking at which operas I will be able to see this time next year when I am back in NY. I will be able to see 5 operas next time! Meanwhile I will just have to hear about them from you. No, he was sitting next to a couple I was chatting with at intermission and I guess he introduced himself to them or vice-versa. And then they mentioned it to me — that he was there to scout. I do keep playbills but the Comte singers name is unforgettable, Pretty Yende. And the other women I remember: Opolais. Not sure either one is around for next season (don’t they contract the leads years out ?) but I didn’t read too closely what they are doing next season or the casting other than Netrebko in Onegin, which I know only as a ballet not an opera. In fact, ABT is opening their season with Onegin a few days after The Met closes. Yes, you should definitely check out Rigoletto if you have the chance. Did you catch Parsifal ? That one was interesting and not doing it next year. In fact, no Wagner next year at all I think I read. How they will amortize The Machine is a mystery. Unless they were included with the sets and props that the Met got from Glyndbourne, I wonder how the Met got the costumes for de Niese on such short notice. The Met’s costume shop had to make a complete new set for Dessay, since she is so much smaller than Danielle. Not sure why he tried to insult our intelligence with the story about de Niese being set to be part of the audience but there you go.. So good for him for preparing. Everyone seems to enjoy beating on the guy. Not sure why. But I don’t know the history like others. I do like Gelb does a lot of new “modern” productions. Sounds like Dessay has a few runs on the board then. It all comes down to this weekend’s Live in HD telecast – she will surely not want to miss that one. At least this would give me chance to watch her in it when it is screened in Australia. Not long to go in the season. I presume you did not sit through the Ring again? Our Australian Ring is coming up in 7 months and I am looking forward to seeing how they stage it and how our singers go with it all. Hoping it will be great. I saw Das Rheingold, which I didn’t like — again. Such a long opera to watch without a break, even for applause. Why did you go again? Are you going to see the whole Ring Cycle again? I hope they have used top singers again this year. And I hope they all make it through all the performances! Are there any more other operas this season besides the Ring? Tonight I am off to another Handel here, and the recent success of Giulio Cesare has made me very optimistic about it. It is Partenope, and is to be sung in English and has a comic aspect I think. Review to follow shortly.. Yes, DR is very long to sit through being 2-1/2 with no break. VERY LONG. I intended to see The Ring again which is the only reason I saw DR (I prefer the other installments). And I was given a freebie. But not sure I’m up for the rest of it. I saw Dialogues des Carmélites this morning, which is the last new show of the Season. And the opera they close the season with this Saturday night. I didn’t care for it. Though 11AM, Saturday on a very nice day didn’t help. It’s a grim opera. I saw Valkyries this evening. Some patron that seemed quite sure of his information informed me that not only are they not doing The Ring next season they are not doing it during the 2014-2015 season. Don’t know it that is true but if so that would mean at least 2-1/2 to 3 years until they do Valkyries for the 537th time (actual number of next performance). Wow if is that off the program for that long you will almost need a new screen name. Like you said earlier, I don’t know how they will amortize the cost of ‘the machine’ if they do not perform the Ring production. I suppose it will make people more keen to see it when it returns eventually. Lucky you are going to see it all again this time. Just realised that I didn’t reply to your previous post. Totally agree that 11am is a very odd time for an opera. I wonder how the singers can warm up by that time of day. I’ve never seen Dialogue of the Carmelites but it sounds like I haven’t missed too much! I hope you get to see Roberto Bolle at ABT. He is my favourite. I think he is appearing in Giselle. I saw him dance this at La Scala. Only saw 2 out of 4. Don’t go by me. The reviews were excellent. The Met typically plans for its sets and costumes to last for 20 years, so the machine will be with us for quite a while, even if the Ring has a hiatus of a year or two. Basil, I’m not surprised by that given the investment they make in each production (and The Ring especially). The Ring appeared well attended. I’d guess as good or even better than last year and without last years novelty factor. I don’t think there were many (if any by showtime) tickets for the last cycle in the upper 2 sections (several diehards have told me they prefer the Balcony to the Orchestra for Wagner, the sound being much better) and not too many in the Orch. Re Bolle, I saw him tonight with Julie Kent in a World Premiere called Apotheose (music by some dude named Ludwig Von Beethoven. How’s that for a name. Something called Symphony No. 7 in A major, which I quite liked. I’m pretty sure Mr. Bee ripped it off because I think I heard it in the movie The King’s Speech) choreographed by Marcelo Gomes as part of the Opening Gala to begin the season (Hand it to The Met staff. A grand total of one day off between the last day/night of the Opera and the open of ABT). I’m mostly of the view though that as far as ballet the guy is there in lieu of a moving Barre. Something to hold up the women. Speaking of which, quite the crowd. I bumped into both Sigourney Weaver (the actress) and Sasha Cohen (the Ice Skater) and too many models to count. Someone told me they saw Uma Thurman but, alas, I missed her. It is all in a day’s work for the Mets phenomenal backstage crews. They routinely erect and strike two sets almost every day – one for a dress rehearsal in the morning and another for the evening performance. Clearing off the “machine” just involves rolling it off on the left wagon. Wow that really seems like a long way off. I guess it means that there will be quite a different set singers involved in the performances. Hadn’t heard this news so thanks for sharing. Glad you had the chance to see Robert Bolle in action. As far as moving barres go he is quite the star. Loved your comment about Beethoven stealing music from The King’s Speech! I hope the feds get him for breaching copyright.